Over the past year, I have spent a great deal of time scrambling the flatirons, the giant rocks ornamenting the skyline of Boulder, Colorado. For the uninitiated, here’s a quick primer: scrambling is doing easy rock climbs without a rope. The routes are still considered technical rock climbs, but they are of a very easy grade. Boulder is very unique, in that the flatirons above town have dozens of these easy routes that are hundreds of feet long. 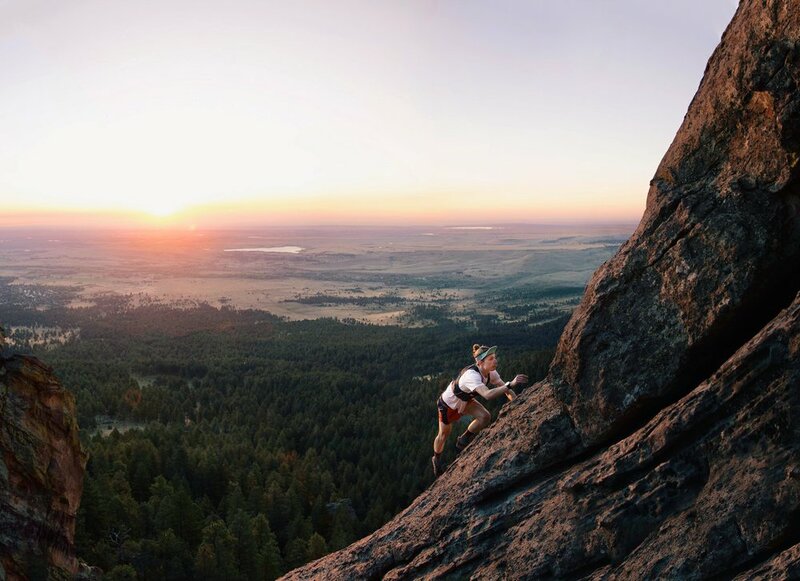 Scrambling these long routes combines the endurance of running with the technical aspects of climbing. Scrambling has helped me with the headspace required to be hundreds of feet off the ground with the only “safety equipment” being my own fitness and my shoes. It has helped me learn the routes on these beautiful rocks, along with the access routes to and between them. Somewhere along the way, I decided it would be a fun test of my endurance to attempt 14 scrambles in one day. No ropes. No special gear. Just me, my shoes, some food and water, and a whole lot of scrambling. The linkup I chose was actually inspired by Bill Wright, who I ran into one day last fall while he was doing a “top ten easy climbs in a day” linkup. The word “easy” might be misleading there… while each individual climb is graded no higher than a 5.6, these climbs are long and strenuous, and the steep bushwhacking between them doesn’t offer much of a rest. 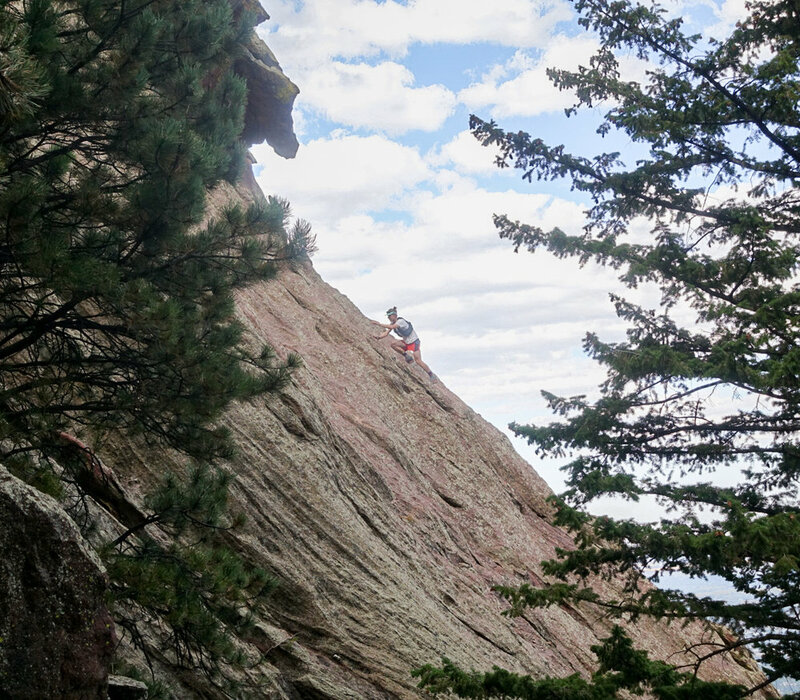 Linking up the flatirons requires traveling off-trail for most of the day and keeping a cool head all the while to make sure that each move is safe and controlled. After all, if you slip, in many places the resulting fall could be hundreds of feet down. As the chosen day approached, two logistical details became increasingly relevant. First, the high temperature for the day steadily rose in the forecasts from 76˚ to 86˚… not ideal. I had hoped for a day that was a bit cooler. It turns out that these giant, exposed, east-facing slabs of rock soak up the heat, which would leave me practically baking on the rock. On the up-side, though, by choosing a weekend, it meant that Molly was available willing to crew for me. Since this was going to be a monumental undertaking, I welcomed the support. Molly ended up being so much more than a mobile aid station. She was encouraging; she helped keep me grounded through a really brutal day. And so, at 6am on this chosen Sunday, I embarked on my mission from the Cragmoor trailhead. Molly wished me well, kissed me goodbye, and watched me hike off into the darkness. I actually started the day off with company, though. Nick Zepeda, a friend, coworker, and badass adventure photographer joined me for the first route. I usually scramble by myself, so it was nice to have a friend tag along for the start. The sunrise was stunning as we summited Central Shanahan Crag. Nick approaching the summit of Central Shanahan Crag just as the sun rose. It was pretty serene start to the day! We quickly bushwacked to the bottom of The Slab, where I left Nick and embarked on the next climb of the day. The next few routes went off without much incident. I was feeling good. Strong, even. My favorite climb of the day was the fourth route: Seal Rock’s east face - north side route. It was 850 feet of super-fun climbing. Ticking off route #1 of the day. 13 more to go! Checking my line up SYZYGY on The Slab, my second route of the day. Unfortunately, it was directly thereafter that I hit a snag in my day. The local power company had closed the one piece of “real trail” I would be using for the day to do work on the power lines. To ignore the closure could mean $1000 fine or jail time. I decided to turn around and headed back to the start. Bummer! But not the end of my day. Nick drove me to a nearby trailhead (NCAR, for those of you who know the area) where I could get back onto open trails. Not a big deal. I could still complete the linkup, even if it wasn’t the exact route I had planned. On my way to the next route, I met Molly at my first “aid station.” I knew I would be pounding tons of water to combat the heat, but I didn’t expect to be so thirsty quite so early in the day. Things were heating up! Off I went to Front Porch, Stairway to heaven, and Angel’s Way. At this point in the day, I began to realize just how challenging things would get. I made sure to take my time in order to conserve energy. After this grouping, I headed over to the five “major” (read: numbered) flatirons, which would hold the remainder of my routes for the day. By this point in the day, it was freaking hot. I found my way to the Fifth Flatiron, but not before first getting on the wrong damn rock. Whoops! Oh well, not the first time I’ve made such a mistake. I got through the Fifth and made my way to to the base of the Fourth, where Molly was waiting at my next mobile aid station. I proceeded to drink an appalling amount of water before heading upwards once more. At aid station #2, I was halfway done with the day. Seven routes down, seven to go. Alrready feeling hot and tired at the halfway point. Then I got on the east face of Fourth Flatiron and started up it. This was the low point of the day. I had begun cramping pretty much all over my body. My feet, my hamstrings, and my calves bore the worst of the tightness and fatigue. The Fourth Flatiron is 1,000 vertical feet that is actually three separate pieces of rock. It felt like such an ordeal to get to the top of this one. I was pretty fried while trying to get off the summit. Luckily, the downclimb is a single move. East Face of the Fourth Flatiron. Route 8 of 14. From there, things got better. Sort of. A few clouds came in with a gentle wind. The breeze and the reprieve from the sun helped cool me down, which helped my sanity. My body as whole, though, continued to feel just awful through the rest of the day. My cramping would only get worse. The bottoms of my feet were as sore as they have ever been in my life. Oh, and the fatigue. It turns out that this sort endeavor is tiring (shocking, I know). In spite of the physical distress, the rest of the day felt successful. I was going pretty slowly by this point, but I was still able to make the moves I needed in order keep myself safe while maintaining forward progress. I love climbing the Third Flatiron. The 1,300 foot East Face Left route was the longest of the day. In spite of the strain on my body, I still enjoyed the hell out of this route. The downclimb off the Third is the longest and most serious downclimb of the day. I was glad that it went off without incident. I then climbed up the more vertically inclined, but relatively short, Winky Woo before coming back down the Third a second time. South Sneak of the Second Flatiron. Route 12 of 14. Molly was a sight for sore eyes when I reached the base of my route up the Second Flatiron. Molly gave me water, food, and a much needed push to finish what I had started. With only three routes remaining, I knew I could bring this thing to a successful close. I’ll be honest, though, it was nice to hear it coming from someone else. I plodded up the Second Flatiron and Sunset Flatironette before arriving at the last route of my day: the 1,000 foot East Face Direct route of the First Flatiron. This route is the one I have climbed the most often. I know it well, but it was also the hardest route along my linkup, stacking up at a grade of 5.6. My hamstrings really tried to revolt on this route, seizing up on alternating legs as I made each move of the first 100 feet. This quickly let up, allowing me more uninhibited movement for the remaining 900 feet of climbing. After dismounting the First, I began to hobble my way back down to the Chautauqua trailhead, signifying the end of my day. Molly met me half a mile up the trail to cheer me me on as I cried and willed myself to run the final stretch. That was one helluva day! Running in the final stretch to Chautauqua trailhead. I’m pretty sure those people on the left of the photo are getting family pictures taken. Finished! So tired! Sitting in dirt! For anybody that’s interested I’ve included a link to the Strava event.